A week of marathons, half marathons, 10-milers, 10K-ers and even planes, trains and automobiles and all of this not just in the UK but in Italy too! Want to know more?… Then read on! Okay, so this isn’t Monty Python, but this time the Italian’s organised the Acea Maratona di Roma (Rome Marathon) and Sudbury Joggers had a man on the ground. Jamie Fittock ran in very hot conditions and completed the marathon in 3 hours, 29 minutes and 46 seconds. Who can’t be happy with a time like that? If that marathon time isn’t good enough, then you should always look on the bright side of life… sorry, couldn’t resist a Life of Brian joke, but there’ll be no more Monty Python jokes, I promise! You might be thinking this is another movie reference about the 1987 film “Planes, Trains and Automobiles” and you’d be wrong – this time! This time I’m talking about the 2018 Planes, Trains and Automabiles trail run that was a little closer to home than Rome and the first of multiple races being attended this week by members of Sudbury Joggers. To start this week off on Bank Holiday Monday, we had 5 Joggers run the very, very wet and muddy trail run organised by The Company of Runners at Great Notley near Braintree. Despite varied start times for everyone, we had all the Sudbury Joggers rank one after the other from position 15 through 19. Gin Lawson finished in 1:35:47 with Lisa Dalton not far behind her at 1:36:01. Anna and Mark made it a buggy trail run and made it back in 1:43:09. Finally, Steve Roberts completed his first trail run in 1:59:17. Later in the week we had 3 members of Sudbury Joggers run the Bungay Marathon and a further 12 run the Bungay Half Marathon. Kallum Breward got over the Bungay Marathon finish line at a time of 3 hours, 27 minutes and 58 seconds in 20th position. 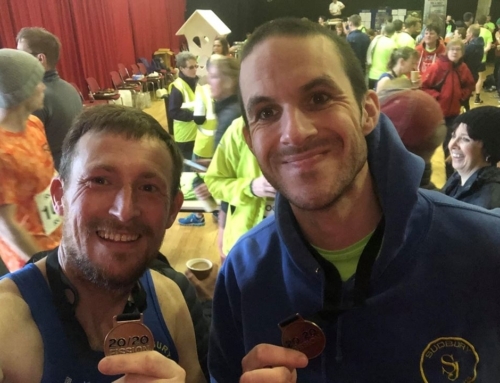 Next crossing the finish line was Dee St Ledger who finished in 3 hours, 46 minutes and 39 seconds and Gin Lawson ran the marathon in 4 hours, 27 minutes and 49 seconds. Running the Bungay Half Marathon, we had Todd Lewis (1:27:24), Sandy Thorogood (1:36:07), Jackie Hann (1:44:41), Jeremy Holt (2:09:51), Ruth Cowlin (2:10:40), Hannah St Ledger (2:27:56), Sally Buckle (2:28:08), Sharon Breward (2:28:10), Steve Roberts (2:52:31), Zoey Battell (2:52:31), Sandy Maloy (3:00:53) and Sue Moye (3:00:54). Kallum Breward, Dee St Ledger, Todd Lewis and Sandy Thorogood also came in first of their age groups. On top of all that, Dee St Ledger was the third female to cross the line and Steve Roberts got a new personal best knocking 7 minutes and 21 seconds off his first half marathon result only two weeks previous. A not so little team at Little Bromley! Sudbury Joggers were also out in force over at the Little Bromley 10K with 10 members attending. Jimmy Secker finished in a time of 44 minutes and 35 seconds with the rest not too far behind. Crossing the finish after Jimmy was Kieron Savage (0:45:00), Gary Godfrey (0:46:31), Stuart Bealcollins (0:50:16), Lisa Dove (0:50:31), Jenny Merry (0:55:08), Melonie Evans (0:55:09), Jacquie Webb (1:03:09), Rachel Miles (1:13:18) and Brian Bloomfield (1:13:19). Sudbury Joggers couldn’t have run any more races, could they? 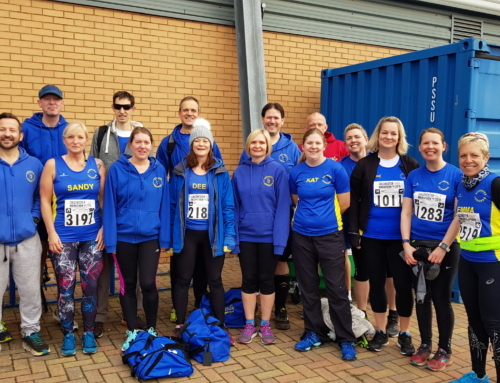 You would have thought that with big turnouts at Bungay and Little Bromley, plus a Joggers over in Rome that we could not have had people attending even more races… well, we did! Running the Wings Croydon Half Marathon was Kieran Hayles and Darren Barfield. Kieran Hayles came in 1st place at a speedy time of 1 hour 17 minutes and 49 seconds. Not too far behind was Darren Barfield who finished in 27th place at a time of 1:31:10. We had Gary Crowley running the Heybridge 10-mile trail. Gary came in joint 7th out of 45 runners at a time of 1:36:15. Chris Wells ran the St Clare 10K at Hastingwood. Chris said that it was very tough conditions in Essex that morning and it was the hardest 10K he’d ever done! Despite that, Chris completed the race in 45 minutes and 5 seconds and narrowly missed out on a new personal best. On Saturday, April 7th, 2018 we saw 19 members of Sudbury Joggers run at our local Great Cornard parkrun, with other members taking part at Colchester Castle parkrun, Bury St Edmunds parkrun, Clare Castle parkrun, Harwich parkrun, Mersea Island parkrun and finally, Dominic Turner attended Felixstowe parkrun‘s very first parkrun. 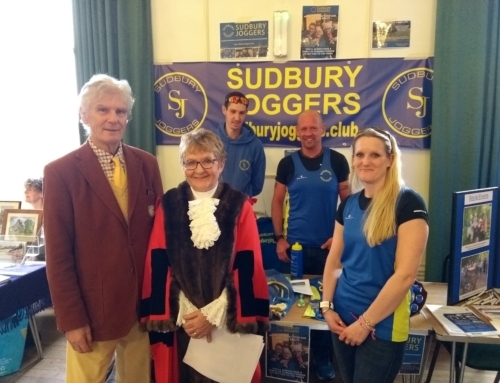 Well done to all the many Sudbury Joggers that were out at races this week, it was another impressive turnout and results. 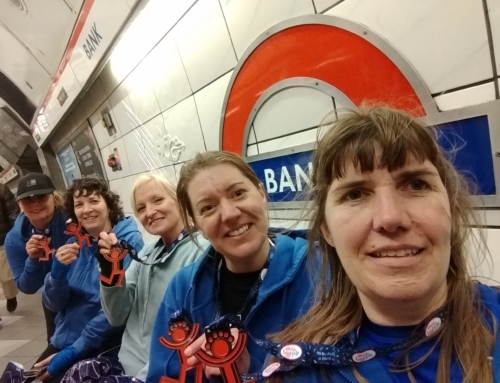 Next week we have many members running marathons, many for the first time, plus we have over 20 members training for the London Marathon on April 22nd who are starting to taper. Good luck to everyone running and training in the week to come, you can do this.